India's police force has been accused of extrajudicial killings, torture and carrying out illegal detentions, human rights campaigners have said. "India's status as the world's largest democracy is undermined by a police force that thinks it is above the law," Brad Adams, Asia Director of Human Rights Watch (HRW), said on Tuesday. "The police continue to use their old methods: abuse and threats ... It's time for the government to stop talking about reform and fix the system." 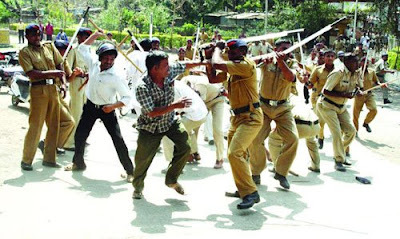 A report - titled Broken System: Dysfunction, Abuse and Impunity in the Indian Police -collated from interviews with 60 alleged victims and about 80 police officers of various ranks detailed various abuses. Several officers admitted in private that suspects were often tortured and beaten to extract confessions, the report said. A female suspect was killed in custody in one case and her killing passed off as suicide, a police officer said. Some also spoke of manufacturing "encounters" during which a suspect was killed and the death passed off as taking place during a shootout. In the city of Kolkata, the capital of West Bengal state, Ghaissudin Mohammed Mondal told Al Jazeera that he was tortured after being arrested for refusing to pay bribes. "They picked me up by my legs and crashed me onto the floor. Then they stripped me naked," he said. "The policemen forced me to bend over a table and then inserted some chemical in my backside - I started shouting in pain." The HRW report said that India's police system needed a major overhaul, noting that officers were poorly trained and overworked. It said that many officers work as many as 16 hours a day, rarely have days off and live in tents or cramped and crumbling barracks. K.P.S. Gill, a former police chief of Punjab state who has written widely on reform, said the problem was wider than just the police force. "The resources in the country are not that large and there are unlimited areas crying for attention, so [officials] have to make a selection of what they would spend how much on,'' he told The Associated Press news agency. "Policing doesn't figure very high on the list." Several Indian police commandos have been suspended after an extraordinary series of photographs were published apparently showing the killing of an unarmed man in the north-eastern city of Imphal. Authorities in the state of Manipur have promised a judicial inquiry into what appears to be a "fake encounter" – a tactic used by Indian police to dispose of suspects who they do not believe will be dealt with by the courts. The publication of the photographs comes days after Human Rights Watch published a highly-critical report into the conduct of the Indian police in which it highlighted the use of extra-judicial killings. The pictures, published in the respected Tehelka news magazine, appear to show the sequence of events leading up to the shooting dead of a former militant, Chungkam Sanjit, and the aftermath of the encounter. The body of a pregnant woman is also shown; police later claimed she had been killed in crossfire with Chungkam. According to the official police account of the incident, which took place on 23 July, police were frisking people in the tourist city's Khwairamband Keithel market when they spotted a suspicious youth and challenged him to stop. In the police version, Chungkam pulled out a gun and fled, firing into the crowd. They claimed he was finally cornered in a pharmacy and was killed after refusing to surrender and opening fire with a 9mm Mauser pistol, which was purportedly recovered from his body. But the pictures – taken by a local photographer who has not been named by the magazine for his own protection – appear to tell a rather different story. Chungkam is first seen standing next to the pharmacy alongside a number of heavily armed commandos. Far from opening fire and fleeing, he instead appears calm and is seen walking away with one of the commandos. There is no sign of any weapon in his hands. Another picture shows a commando drawing a pistol and Chungkam is then seen being hustled into the pharmacy. In the last frame in which he is still alive, he still shows no sign of resistance. The next picture shows him being dragged out by his feet and he is then dumped in the back of a pickup truck. The dead woman's body is also partly visible in a later frame. In another notorious recent case police were accused of killing two Muslim men in Delhi last September in the aftermath of a series of bomb attacks in the Indian capital. But despite many questions being raised about the police account of the incident, the National Human Rights Commission last month cleared police of any wrongdoing.